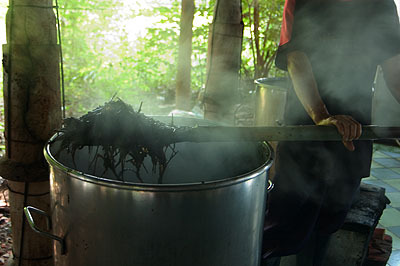 At a grass jelly factory, the secrets behind the popular dessert are revealed. 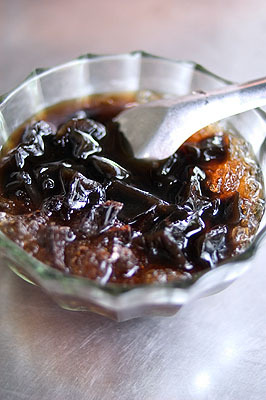 Perhaps you’ve encountered a Thai dessert consisting of small black cubes of jelly served with crushed ice. Like me, you probably took one look and said “no thanks”, opting for something a bit, well…less black and jellylike. Next time however, I urge you to try that dessert. It’s called grass jelly, and is actually a pure and delicious product. And if you believe the manufacturer, a very healthy product as well. A bowl of grass jelly at a Kamphaeng Phet restaurant. I recently became aware of grass jelly on a trip to the city of Kamphaeng Phet. The dessert, which Thais call chao kuay, seemed especially popular there, and on a whim I stopped by Chao Kuay Chakangrao, a small grass jelly factory. Arriving unannounced I was greeted warmly by the company’s owner, Sermwut Suwanroj, who was happy to take me around his factory and reveal how this unique dessert is made. Suwanroj has been making grass jelly full time for a little over three years. He claims that it was his success that inspired the grass jelly craze that seems to have swept over Kamphaeng Phet. “I was the first one to make it here,” he explains. “All the others followed after me.” Suwanroj’s business is not limited to this small northern city though, and his product is sold in Bangkok and even abroad. 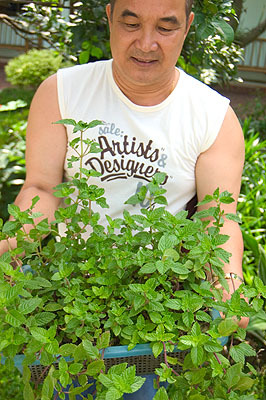 Sermwut Suwanroj, owner of Chao Kuay Chakangrao, shows a pot of the fresh herb used to make grass jelly. The dried herb used to make grass jelly is imported from China and Vietnam. We enter his factory and I am shown blocks of the dried herb, which is thoroughly rinsed of dirt several times before entering the first phase of grass jelly production. This involves boiling the herb in water for two to three hours in an effort to extract the fragrant oils. This is done by hand in large barrels over charcoal-burning stoves, much as it would have been done in the past. After three hours the liquid has developed a sticky, glue-like consistency, and the unmistakable earthy, medicine-like odor of grass jelly has flooded the open-air room. 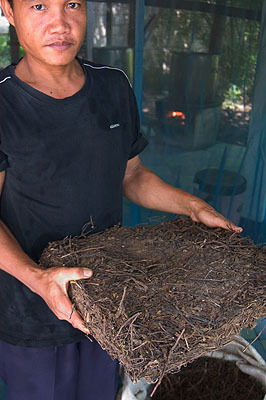 The dried herb must be boiled for two to three hours to extract its fragrant resin. The next step involves pressing and straining the thick liquid, which at this point resembles something like crude oil. The strained liquid is blended with a small amount of flour and put into a large steam-powered mixer where it is kneaded for one hour. The smooth jellylike liquid that results is then spread out onto several shallow trays where it is left to cool and solidify. The resin is then extracted (shown above) before being filtered, blended and cooled into jelly-like sheets. 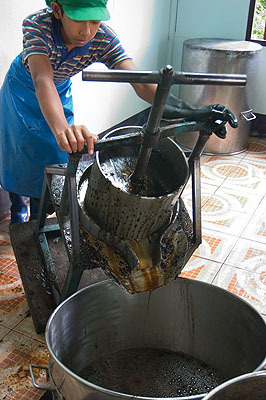 The final step in production involves simply cutting the solid mixture into small squares, which are packaged with syrup. At this point Suwanroj offers me a bowl of grass jelly, which in the Thai style, is served with crushed ice. Suwanroj’s grass jelly is more fragrant and slightly toothier than grass jelly I’ve had in the past. I find the dessert a tad too sweet, but immensely refreshing, especially on this hot morning. This is hardly surprising, as the herb used to make grass jelly is in fact in the mint family, and is known by the Chinese for its cooling or “yin” properties. While I enjoy my treat, Suwanroj expels the supposed health benefits of grass jelly. “It lowers your blood pressure, it cures colds, and helps to cure infections and relieve diabetes.” He explains that it is particularly beneficial to drink the boiled herb as a kind of tea. I am skeptical, but I can’t imagine a more appropriate spokesperson for grass jelly than this vibrant and enthusiastic man. This article as it was printed can also be read here at the ThaiDay website.